“Mama! Mama! Mama! Mama!” is about the way a few hours of every day goes for me with my 17 month old. She insistently calls for me and wants to be held, hugged and paid attention to. So, we read books, sing together, cuddle, and sometimes often times I find myself completing tasks with one hand while she’s happily perched on my hip. But, like many moms, I put up with it and try to enjoy it as much as I can. She’ll only be this little so long. I know that it’s only a matter of time before she becomes more independent. My nearly four-year-old on the other hand is quite independent. He likes the occasional snuggle and asks to be played with from time to time. But, most of the time he can be found happily digging with his trucks in the dirt, coloring pictures beside me while I work or making up an intricate story line with a few model dinosaurs. He also likes to help wash dishes and hang up laundry or page through a book. As a baby and toddler, my son was similar to my daughter. He was attached to me or his father at most times. While he enjoyed wandering off on his own to play for a while, he was more often than not like velcro. That’s my real life experience that shows me that being close and connected leads to independence. But, there’s more to it than one mom’s journey. It must be some sort of rule. All toddlers seem to LOVE water play. And have you ever noticed how at a certain stage, babies become determined to move on their own, struggling until they achieve the ability to walk? These are examples of sensitive periods. Throughout childhood, children experience a number of sensitive periods. Some last for years at a time, and others may only last several months. 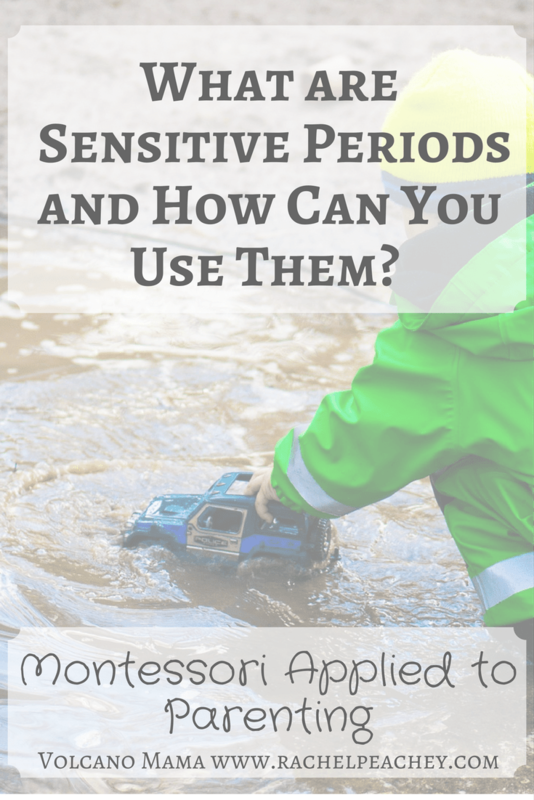 Montessori coined the phrase “sensitive periods” to refer to times when children have an especially strong motivation and interest to learn about a particular subject or master a certain skill. In her observations, she discovered that many children share a lot of the same interests around the same time in their development. As parents and teachers, we can take advantage of these sensitive periods to help guide our children’s learning. A perfect example is language. 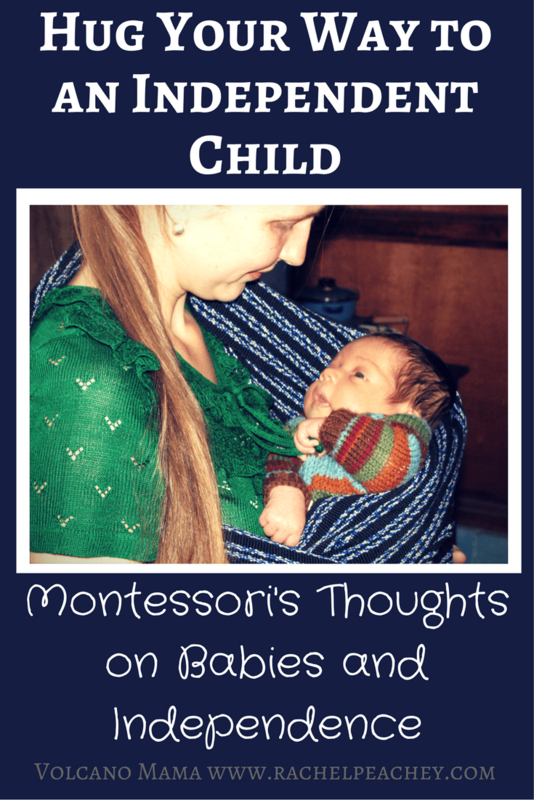 Montessori noticed that children experience a sensitive period in language from birth through about age 6. Positive reinforcement is a popular parenting technique. Basically it means parents and caregivers praise good behavior. This way, children are motivated to continue their good behavior due to the positive attention they’ve received. Positive reinforcement can also include sticker charts and other similar incentives. All sounds good, right? 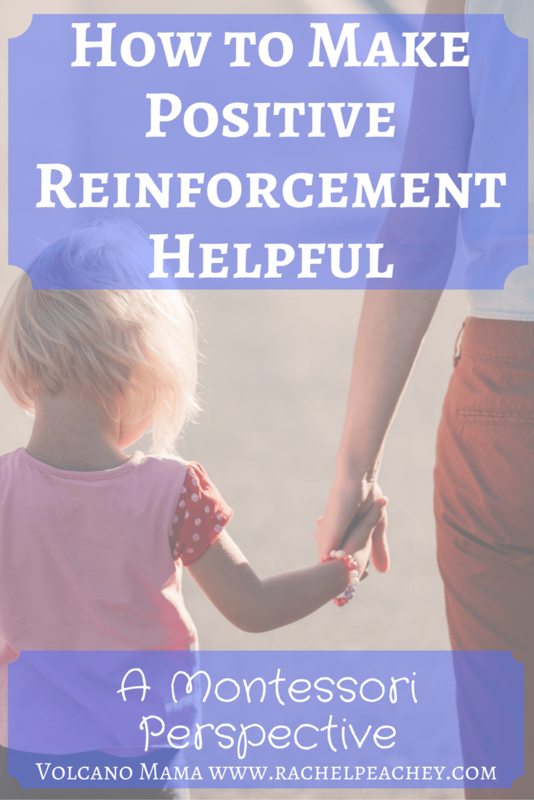 Positive reinforcement can be very helpful for children. It can help them learn that good behavior is appreciated and that their efforts pay off. But, it can also turn into a big happy praise fest that teaches your child that they are the BEST, in the worst cases resulting in narcissism. One of my parenting goals this year is to teach my oldest about advent. What better way than through an advent calendar for kids plus daily activities? The combination of reading a bible verse and doing some fun holiday activities such as making decorations, baking cookies and setting up the nativity scene not only teaches about the meaning of Christmas, but will also bring us closer together as a family. We had lots of fun making the advent calendar together. The basic idea of this calendar is that each day we’ll break open one of the numbers. This is very appealing to Peanut…he can’t wait to punch through the paper to see what’s inside! I also find it quite tempting, I must admit. Inside are 2 slips of paper, one is a Bible verse and one is an advent activity, and a small piece of candy for each of my kids.